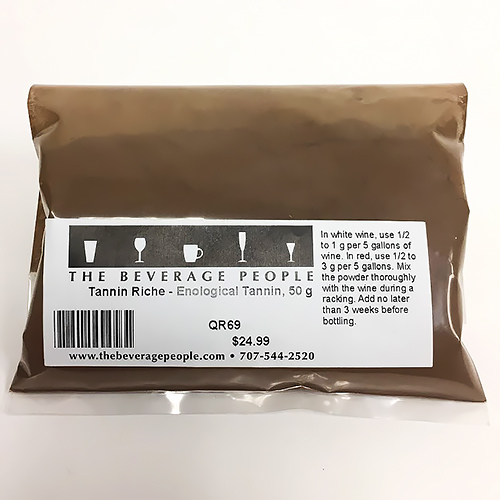 The primary role of these enological tannins is not to add anything, but rather to give themselves up as ‘sacrificial tannins’. Added early in the fermentation cycle, these tannins combine with proteins and other grape components and precipitate out into the lees. 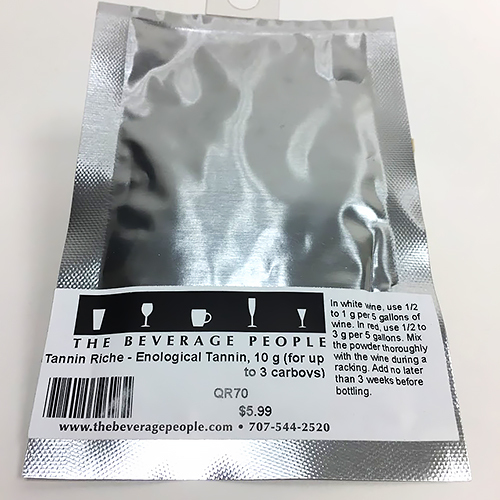 Because these enological tannins are available for those reactions, natural grape tannins are preserved and are able to combine with grape anthocyanins to create optimally stable color. How to Use: Add after the onset of yeast fermentation, such as at first punch-down. Sprinkle powder directly over the must. How to Use: Add as powder to the juice in the fermenter, stirring thoroughly or add to juice after it is racked off gross fruit lees. 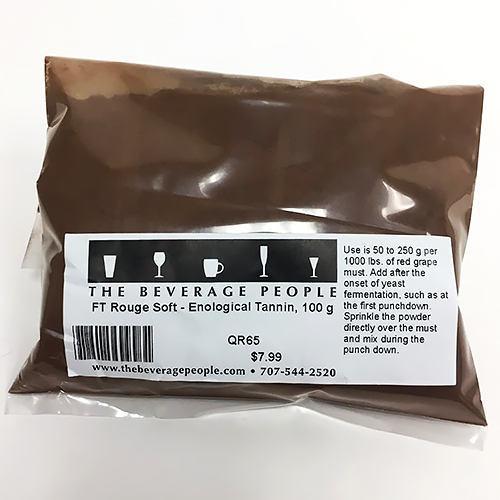 How to Use: To provide sacrificial tannins, sprinkle on top of the cap and mix directly into red wine fermentor during the first few days of fermentation. The cellaring tannins can play an important role in the development of wine throughout the aging period in the cellar. As with other tannins, they can help protect against oxidation during the storage period, as well as adding nuances of flavor and mouthfeel to wines that may not be aged in barrels. How to Use: At the 1st or 2nd racking after primary fermentation, mix the powder into the wine as you transfer it. How to Use: Wait until malolactic fermentation is completed before adding or if not undergoing ML, add at the end of primary fermentation. Mix measured dose with the wine during the first racking. 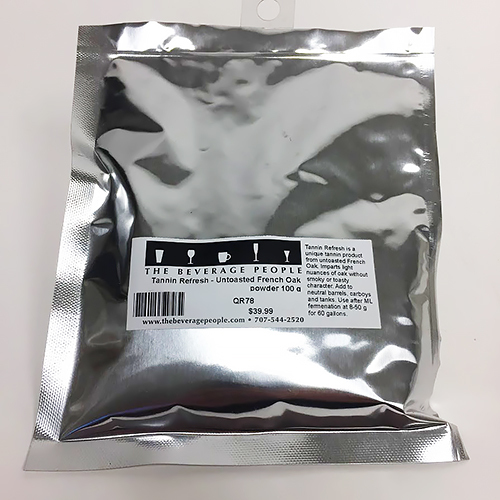 Rate of Use: Up to 2 or 3 oz. in 5 gallons of wine or 8 oz. per 60-gal. barrel. How to Use: Add to carboys, tanks, or neutral barrels during aging. In about 3 to 6 weeks, you may rack off (or leave the cubes in until the next racking). Use of a nylon mesh bag that fits your aging container may maker removal easier. Fine oak tannins can be used later in wine aging to impart character that may be lacking from the grapes or barrel. Especially when derived from quality French oak, these tannins can impart welcome notes of coconut and vanilla, possibly even a perception of sweetness, to a finished wine. 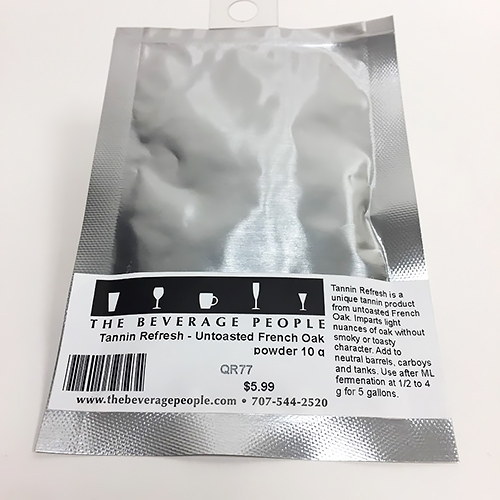 How to Use: Mix powder thoroughly with wine during a racking. Add no later than 3 weeks before bottling. As described in “Cellaring Tannins” above. 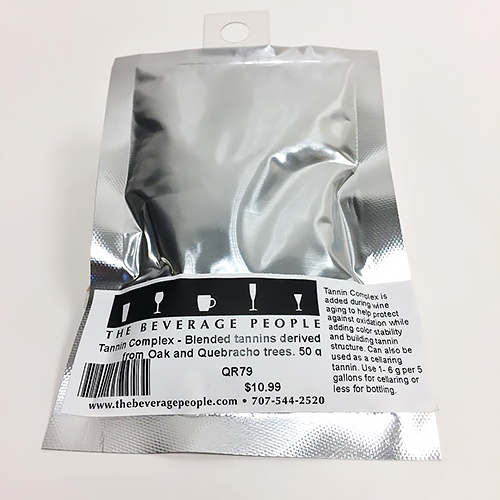 How to Use: Do a trial with a small sample of your wine, calculate your addition, and add the extract directly to with wine in carboy or barrel. May be used up to bottling day.